St John the Evangelist Chapel was a privately funded church built in the early 19th century, a time that saw a rapidly increasing local population and a shortage of places of worship. In Chichester at this time, there was the cathedral and six smaller churches but this was deemed to be inadequate by a number of locals who belonged to the Church of England and wanted to practice their faith. An Act of Parliament was required to build a new chapel and permission was granted in 1812 to purchase land for the building. The site chosen was ‘New Town’, land that had belonged to the Black Friars between 1289 – 1548 and was sold after the dissolution of the monasteries. A set of trustees were appointed, each of whom had donated more than £100 for the building of the chapel. Further funds for the construction were raised by public appeal. The combined total raised to start the project was over £5,069.The foundation stone of the chapel was laid on May 25, 1812, by the trustees and Mayor and Corporation of the City. The chapel was designed by architect James Elmes, who had worked on several buildings in and around Chichester including the Central Boys School (1812) and the Cathedral (1812–1814). St John’s is octagonal in shape, has three separate entrances and has a campanile (or bell tower). It also contained a ‘three decker’ pulpit which remains to this day. Each level of the pulpit was used for a different purpose – the lower level was used by the parish clerk to lead responses to psalms, the middle level was used by the minister when leading the service and the top level was used by the minister during his sermon as it was imperative that everyone could see and hear this part of the service. 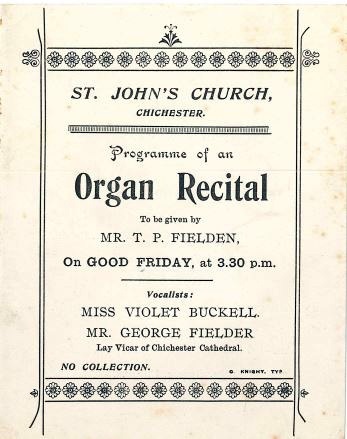 The building funds that had previously been raised were soon depleted and it was decided by the trustees to raise further income by the selling and renting of pews, namely those in the upper gallery, to richer members of the congregation. The upper gallery had the best views of proceedings, afforded the best audio and could be accessed through separate entrances to the non-paying members of the congregation. In August, 1813, a two day ‘Music Meeting’ was organised to celebrate the new chapel. Performances took place in St John’s and at the Assembly Rooms, North Street. Unfortunately, the event was not as well attended as hoped and the event ran at a loss. The chapel was consecrated by the Bishop and opened for public worship in September, 1813. The first minister was Rev Stephen Barbut, who was appointed with a salary of £80 a year. The site proved extremely popular after its opening and by 1853 had a congregation of over 500 people. In 1879, a Sunday school was built on land next to the chapel. Classes took place twice a day and boys and girls attended separately. The Sunday School continued for more than 70 years. The school room was also hired by community groups, including the Scouts, who helped to raise funds for the church. During the Second World War, a shortage of suitable metal for weapons meant scrap metal was gathered from around the country to increase supply. This saw the removal of the iron railings and gates from outside the front of the chapel. Hedges were later put in their place. St John’s Chapel was designated as a Grade I Listed building on July 5, 1950. In the middle of the 20th century, congregation numbers started to decrease and it was joined, under one minister, with the church of St Pancras. This was not a popular decision with the trustees or the congregation and numbers continued to decrease. In 1973, the church was closed to public worship. The Churches Conservation Trust, a national charity saving historic churches at risk, took over the care of the church and continues to this day. Structural works to restore the building took place in 2003 and the Friends of St John’s was founded in 2005 to support the work of The Churches Conservation Trust and to promote public awareness and encourage greater use of the chapel by the local community. Today, it is used as a venue for a variety of arts, music and cultural events. Compiled using ‘St John’s Chapel and the New Town, Chichester’ by Alan H.J Green.